That conversation above occurred sometime in early 2014. One of my good friends was visiting me and knew I’d just been FINALLY diagnosed with chronic Lyme disease, which meant I was also finally put on proper treatment after over six years of being chronically, debilitatingly sick. We didn’t know how treatment would go, but I was already starting to feel a little better, so we were hopeful. And although my friend had good intentions at heart, the conversation struck a nerve and his own biases were showing. I’ve never been one to follow what others had done, despite my anxiety and fear to do otherwise. So when someone told me I couldn’t do something, or doubted me, or tried to pressure me in one direction over another, it usually had the opposite effect. That’s why peer pressure never worked on me, and too-salesy salespeople hate me as a customer. 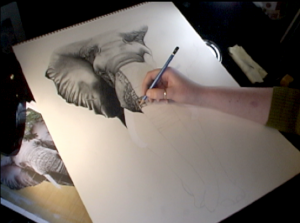 Me working on one of the most difficult parts of my African Elephant drawing. Holy mackerel did I feel offended. And then I felt a growing, bubbling determination in my chest as I talked with him about my potential future, which at that point could have been anything. I was not yet running an art business. I was not yet focusing on my artwork as anything more than a hobby and a therapy, something to keep me distracted and productive during my illness. I was not sure what I wanted to do with my life, if I were to get healthier, because I’d been sick so long I stopped thinking about that possibility. During the previous years of darkness it had only brought me sorrow knowing whatever future I envisioned likely wouldn’t happen. So why was I so offended? Why did I suddenly feel the need to defend my right to become an artist if I wished to do so? Holy mackerel…did I want to be a professional artist? After my friend left, I took a tour of my artwork I’d done up to that date. My Hermit Crab colored pencil drawing, one of my favorites still to this day, was staring back at me from my bedroom wall, and I couldn’t get over the detail in it. My Dolphin colored pencil drawing caught my eye next. His playful expression and his eagerness had me put my hands on my hips and sigh almost in resignation. “I know,” I said out loud. Then it was my Snow Leopard, which was the biggest colored pencil drawing I’d done at that point. She was gazing at me with those eyes, almost pleading with me. My Snow Leopard, Dolphin, and Hermit Crab colored pencil drawings. Inside I had a swelling in my chest. This wasn’t something I had ever planned to do. This wasn’t necessarily a logical choice… but it was a choice that had just been made. It turns out that what started out as an experimental therapy for me with my illness was now much more than that. Now it was a part of me. It was a part of me that had a growing importance in my life. This distraction, this therapy, had unknowingly grown to be a defining factor of who I was, not just something I did, and as I suddenly recognized that, my outlook on it began to change. Suddenly, I was an artist. When people asked me what I did for work, I would say I’m an artist. And for the first time, I could say it with confidence. It wasn’t long after that that I signed up for an art business workshop. If I was an artist, I needed to figure out what that meant and how to make it work. Then I saw a lawyer and an accountant and registered as a business. Within a year I went to a bigger conference in Washington, DC about art business. I applied for and received a grant to help me completely redesign this lovely website and make it have e-commerce and a blog. 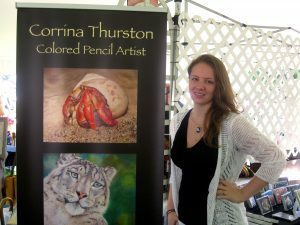 Then I was featured in newspapers and was on the Vermont news WCAX, published in magazines, was guest-blogging, and continuing to make new work. Now that I recognized the connection I had with my artwork, I’ve become more and more connected with it. Now my work is driven by more passion than ever before and I’m putting more emotion into each piece. I’m thinking about the bigger picture of my career as an artist and I’m branching out to help other artists do the same. And now, as my health is slowly continuing to improve, I have fully committed to this work I’m doing. I am an artist. I am an entrepreneur. I am a speaker, consultant, and author. But of course I need YOUR help to make it all happen. YOU are what keeps this journey going and part of why I wake up to do the work I do. So what do you think? Are you strapped in and ready to come along for the rest of the ride and the next part of this journey? Sure…and what a crazy ride it has been so far! We are fellow contrarians!!!! I love cats and contrarians. Good people. Barry gave me the cat mouse pad yesterday, for my 80th birthday. Beautiful. Visiting you sometime this summer is definitely on our “bucket” list. Thank you for sharing your story. You inspire me to have the courage to commit to doing my own creative work! Thanks so much, Kelly! I’m so glad my story has that effect and wish you the best of luck with everything!